It had started simply as we were moving to Italy, or something. Immigration problems and a shifting idea of a sabbatical led to wandering Europe, staying within the feared Schengen Zone. We became vagabonds without a home. The weather turned from the stroke inducing Roman heat into a blasting cold from the North Sea over a single week in southern Spain. 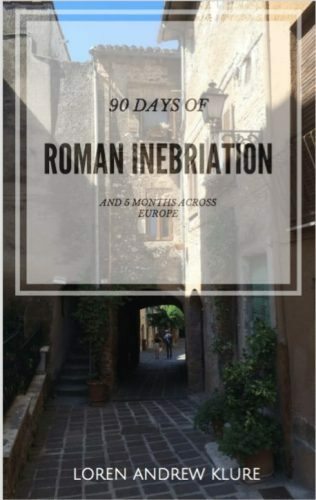 90 Days of Roman Inebriation is a story of a long trip across many countries. Eight months we lived out of a suitcase as it became wine, reading, trains and tramps. Our Visa rejected, we became illegal’s running through the borderless regions of Europe. 13 countries and 64 cities later we staggered home to California. This excerpt is about the differences between Italians, and is set in Rome. The ideals of Italian life I had arrived with were quickly fleeting or altering. It was inevitable that perceptions would change, yet it still surprised or even worried me. There was a constant battle contorting my mind: I should be more diligent in practicing Italian; I should be at least attempting to research the family history; I should be out of the apartment more; I shouldn’t be complaining about the ninety-five degree heat in a studio apartment without air-conditioning where if we leave the windows open the mosquitoes arrive in droves peppering our skin with bites; I should be eating more Italian food; I should, I should, I should! Okay, the last line was a lie. We had worked up an addiction to Italian coffee, and within a month had consumed more pizza and pasta than all of New York City in a single year. My heart was pumping equal parts cappuccino, espresso, and café freddo and was pushing me into a constant delirium of caffeinated trembling. Linguistics was a struggle: anyone who spoke English wanted to practice, and those who didn’t looked at us sideways. On a recommendation from John, I met Simone on languageexchange.com. He was a Roman native in his early twenties studying Farsi and Russian at the main university. We met up at Piazza Del Popolo and again later in Prati. His English was near fluent, my Italian perhaps one level below beginner or even worse. His family owned an enoteca, essentially a wine shop and bar that was four doors down from our Cacio e Pepe obsession and supplied the restaurant’s wine. His cousin Massimo stood behind the counter lined by shelves brimming with wine bottles and pesto jars. He was from an almost uninhabited island off the coast of Sicily, tall and smiling under a pencil-thin mustache. Simone translated as Massimo gave a wildly gesticulated dissertation on the difference between prosecco, which he was pouring us, and spumante. We walked Prati, a little lightheaded from the prosecco, talking about the negative impact of MTV on both of our generations even though we had been separated by the Atlantic. The sky over the hills to the west of the Vatican was red and blazing; heat was bleeding off of the city as the sun set. Rome was a giant radiator. Beerful by Grati was a small bottle shop where a crowd both male and female had purchased beer inside, used an opener strung to the front door, and then drank on the sidewalk. They smoked and cursed and complained about the government. Simone got caught up in a conversation that I couldn’t hope to translate in my head. A long-haired guy holding a beer in one hand and scooter helmet in the other recognized my confusion and asked where I was from. “LA is amazing,” he almost shouted in near perfect English. It was a higher estimation than I held for the city, and I had technically informed him I was from an hour away from LA. The talk of coastal California gradually attracted others. The long, disheveled hair and scooter helmet belonged to Frederico. Maximilian, no taller than five and a half feet, mid-forties with glasses, kept waving his plastic beer cup and sneering as the others referred to him as “piccolo” (small). The third was Marcello, son of two Asian immigrants, with a Filipino complexion and the name and accent of a Roman. “No, not true. Parma is the best,” Marcello interjected. They spoke like something midway between a fierce argument and the intimacy of a familial conversation. “Isn’t that were Ferraris are built?” I asked lamely, attempting to fit in and at the same time tame the argument. “Whose pizza is better, Rome or Naples?” I asked. No one said anything but instead exchanged a mess of hard-faced glances with a sort of tenseness hanging in the air. Had I misspoken? Had I reignited the argument? Or was this simply how Italians behaved? “Roman for sure,” Maximilian and Marcello said one after the other and looked expectantly towards Frederico. “And I’m the only cook present,” Frederico defended his position. Eventually one by one, the assemblage of Romans disappeared into the night, tossing their plastic cups into a trash can and lighting cigarettes for the walk home. It was one in the morning, and the next day Britt and I would be departing Rome in a car for two weeks across the north of Italy. Simone walked me four blocks, and we parted ways with the customary two kisses, one on each cheek. He turned left towards the metro and I right towards the Vatican. I figured walking five blocks to the metro and then switching to a regional train would take longer than just walking directly home, plus I wasn’t even sure either were still in operation. Fifteen minutes later, I had stopped in front of Saint Peters. The square was closed off with less than ten people spread across the perimeter. Three policemen uninterested in us conversed off to one side of the barrier. It was the middle of July, and the night was warm as I stood there transfixed for the better part of an hour. The statues were silent and the massive facade was illuminated. To one billion Catholics, this was the epicenter of the world, the Holy See. For better and worse, feeding the poor and inquisition-ing the innocent, it had been the center of political and theocratic supremacy for the better part of half a millennia. Europe had been a collection of relatively poor and backward nations just emerging from the Dark Ages before Christendom launched it to the crux of global power, dominating every inch of the Earth. This was the once and former king. Glowing incandescent, it was enchanting and uncaring to my presence all at the same time. It was two in the morning at the Vatican and I wasn’t tired. Loren Klure spends most of his time working in finance, writing fiction and travel narratives on the side. Born and raised in Southern California, Loren and his wife have tried to spend as much time traveling in places like Egypt, China, Argentina, Costa Rica and Indonesia, playing the role somewhere between Tourist and Adventurer. 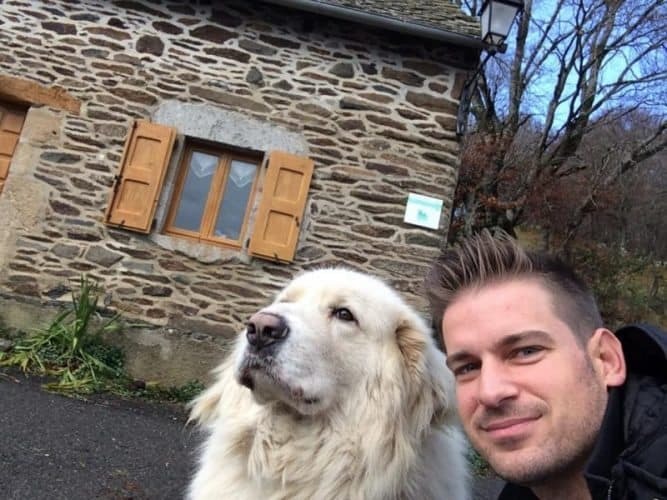 In 2014, Loren and Britt decided to sell their cars, quit their jobs and put their belongings in storage in order to roam Europe for eight months. The result because 90 Days of Roman Inebriation which is Loren’s first book.